Before we get started on tonight's dinner, let me answer the first question asked by all the people (two) when I mentioned what tonight's dinner would be: what is chorizo? According to epicurious (a real authoritative source for a change), chorizo (pronounced chor-EE-soh) is a spicy sausage used in both Mexican and Spanish cooking. Although it is normally made with pork, kosher and vegan versions are available. However, in the tonight's recipe, spices traditionally found in chorizo are used to flavor-up the ground beef instead of the real thing. Hence the "-ish" name. 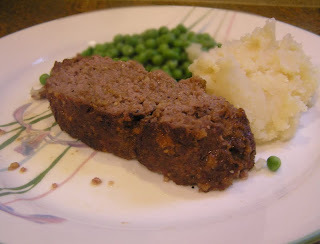 Chorizo tends to be very spicy, but this meatloaf is a tiny bit tingly on your tongue. If you prefer spicy hot, feel free to double the hot paprika and chipotle chili pepper. But if you are the type who thinks ketchup is on the edge, substitute and equal amount of regular paprika or sweet smoked paprika for the chipotle chile pepper. Does this chicken look awesome or what? I am so glad kosher chicken breasts were on sale this week at the local Try-n-Save. 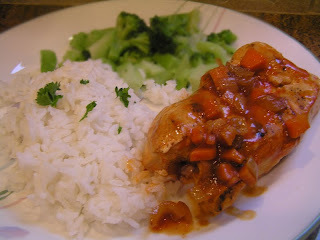 And that I stumbled upon a Joy of Kosher recipe for semi-spicy chipotle chicken. The fact that it was a slow cooker recipe slowed me down none. You could make this the original way by using thighs. Or by utilizing a slow cooker, putting it all together early in the day, but early in the day I barely have time to put me together. But after work it comes together rather quickly, letting it all simmer while starting up the rice. Which allows me the luxury to decompress a few momentos after a long day slaving over a hot library reference desk. YoungerSon wasn't happy with the coconut rice, but he prefers his rice totally naked and flavorless. If you also prefer naked flavorless rice, simply omit the coconut milk and bump up the water. TheHubby and I, however, rather enjoyed flavored rice for a change. Your mileage may vary. Tonight, the part of tomato has been replaced by mango. Sorry, it's 11:00pm and that's the best opener I could come up with at this hour. Luckily the flavor of this salsa really makes up for my lack of eloquence. 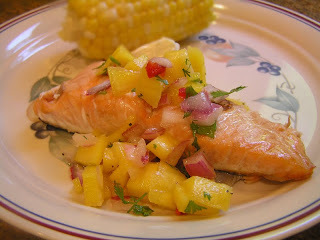 Serve this salsa over fish or chicken. You can also serve it in those tiny phyllo cups as an appetizer. Or eat it with a spoon, as I did with leftovers. First admire your mango. Take note that it is not perfectly round, but slightly flattened. Turn mango so the flat sides are perpendicular (upright) to the cutting board. Then slice through slightly off the center to avoid the large flat pit that is within. Do the same on the other side of the pit.